The VWR 30 Gallon Flammable Storage Cabinet brings you secure storage for your class I, II and III liquids. This safety storage cabinet features 18 gauge all welded steel construction, that’s insulated with 1.5” of air between a double wall. The interior of this flammable storage cabinet has two 2” air vents that are connectable to an air system to maintain safe temperatures, with an adjustable shelf that holds 500 lbs, and a deep 2” spill proof sill. The VWR flammable cabinet also features incorporated grounding connectors, a lockable paddle handle, self-closing, piano hinged doors and a powder coat finish. 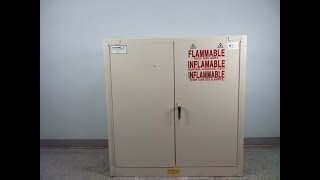 This VWR 30 Gallon Flammable Storage Cabinet has been fully inspected and is in excellent shape. All of our lab equipment comes backed with our standard warranty. Should you have any questions please don't hesitate to contact us.